The human heart is particularly vulnerable to viruses. That’s because cardiac myocytes, the heart muscle cells that give your heart its ability to “beat,” have one major weakness – they don’t reproduce themselves to repair the heart in the same way that cells in other organs do. So damage to these cells from viruses or bacteria is a really big deal. And viruses can and do invade the heart. In fact, 5 to 20 percent of people will have a viral infection in the heart at some point in their lives. Viral myocarditis, inflammation and damage to the heart due to viral infection, ranks as the second leading cause of sudden death in young adults. 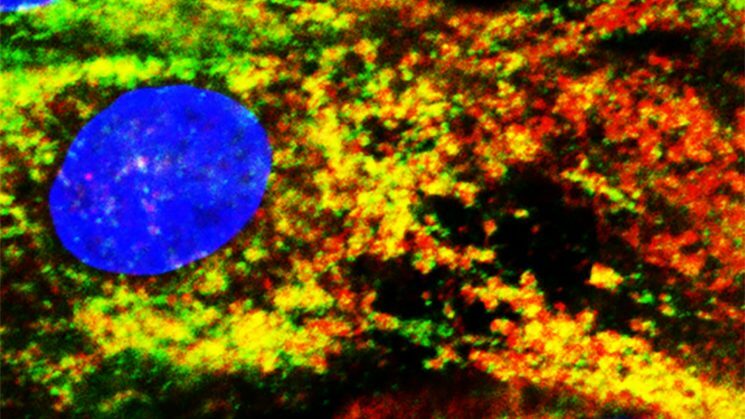 Fortunately, the heart has a unique way to protect itself from viral invasion – a first alert system managed by the MAVS signaling pathway, named for the protein that triggers the pathway to become active. The MAVS pathway is responsible for letting cells know when to produce interferon beta, a natural antiviral. Every cell in our body contains MAVS. Normally when a virus attacks a cell, sensors on the surface of the cell detect the invader and activate the MAVS pathway. Then the cell begins to produce interferon beta, which can help destroy the virus. Cardiac myocytes, however, are special. Barbara Sherry, a virologist at NC State, recently found that in cardiac myocytes the MAVS pathway is always active, and that these cells are constantly producing small amounts of interferon beta. What does this mean? That interferon beta and pre-arming won’t completely stop the virus, but it can keep it under control until the body’s regular (or adaptive) immune system can mobilize to clear it, minimizing damage to vulnerable myocytes. “Cardiac myocytes are particularly vulnerable, not because it’s somehow easier for them to become infected by viruses, but because they don’t reproduce well,” Sherry says. “In the other type of heart cell we looked at – cardiac fibroblasts – the MAVS pathway isn’t always active. That’s because these cells can reproduce quickly and don’t need the same type of protective perimeter that myocytes do. Sherry’s work appears in the Journal of Molecular and Cellular Cardiology. Former Ph.D. student Efrain Rivera-Serrano, now a postdoctoral researcher at UNC-Chapel Hill, is first author. Graduate student Nicole DeAngelis also contributed to the work.